St. John's Wort - Excellent for low summer flowering evergreen hedges up to 1.2 metres tall. 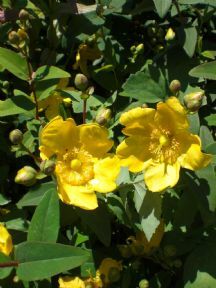 Hypericum Hidcote (St. John's Wort) is a dense, evergreen low hedging, shrub with dark green leaves. Produces bright yellow flowers from mid-summer. Tolerant of all soil types in sun or shade conditions. Hardy. Low growing, habit excellent for low growing hedges up to 1.2 metres or 4ft in height.